The final results will show that Danny Willett won the Masters by three shots, which usually is a convincing win. He won because Jordan Spieth uncharacteristically played like a 22 year old and let the tournament slip away. With a five shot lead, with nine holes to play, it was a given that Jordan would waltz through the back nine and handily win his second green jacket. In the past Spieth has shown a killer attitude to seize the moment and stifle his opponents. This tournament he came back to the field three times in previous rounds when he had a chance to clearly distance himself and put the title out of reach. When he let the field catch up this time, they were there and ready to take advantage. Like a superior basketball team that lets an inferior team stay close throughout the game will many times not have the will or mental-toughness to turn it on at the end of the game to win. Spieth bogied 10 and 11 and when he needed to turn it on, he didn’t have it and dumped two balls in the water at 12. Danny Willett played a five birdie, no bogie round on Sunday. Playing four groups in front of Spieth, he was out of the spotlight and realistically wanting to post a good score to possibly finish second. The Masters is always nerve-racking, but when you aren’t leading and aiming for a high finish, it is a bit easier. However, when Jordan’s quadruple bogie 7 was posted on the giant leaderboard by 15, he then realized that he was in the lead with his playing partner, Lee Westwood, only one shot behind. Westwood in probably his last chance at a major title immediately squandered his chance with a poor iron shot on 16 and then a three putt. Willett hit a career iron to 8 feet and made the putt to increase the lead to three. A wonderful chip on 17 and beautifully played 18th hole made his victory appear easy. What caused Jordan Spieth to choke? Were there signs that this could happen? What was different? The first sign was his slow play. His group was 1 ½ holes behind at one point on Friday. His group was warned for slow play, but it was understood that Jordan was the culprit. The last two days his group was always lagging behind. He has earned the nickname, “slowpoke” among his fellow competitors. The second sign was his indecision. When the television audience could hear the exchange between him and his caddied, it was clear that they were overthinking every shot and that Jordan re-asked questions and appeared unsure of the proper shot to hit. This was prevalent throughout the last three rounds. It actually is remarkable that he maintained the high level of play that long. When his lead was reduced to one shot as he stood on the 12th tee, his one purpose should’ve been to hit left of the pin and over the pond. Instead, he played a bold shot that should’ve started left of the pin and faded towards the flag. Instead it started right of the pin and faded to the only area that could make him lose the tournament. All the indecision and overthinking finally spelled his doom. His next shot was hardly a surprise, because that might be the toughest shot you can have on the whole golf course. What was surprising was how badly he executed the shot. The final sign was the amount of practice swings that he took between shots or even before shots. That shows a lack of trust in your swing and that you are trying to somehow “find it” in the middle of a tournament. Once the tournament was essentially lost, he regained his composure and played the last six holes reasonably well. Pressure was eased, the burden was lightened and he trusted his swing better until indecision arose again on his second shot at 17. Will this collapse be totally devastating and signal the end to his rise to “superstardom”? No, he is 22 and will learn a lot from this setback. He may comeback even more determined. I think he rebounds and wins another major this year, but not the next one. I think a British Open or PGA will be a possibility. But, he has to recognize his mental faults and speed up his decision making and his commitment to his decisions. The swing will come around when he trusts his instinct. 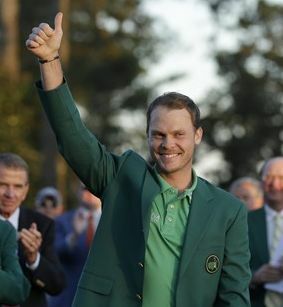 Danny Willett came into the Masters as the 12th ranked player in the world. He is worthy of winning a major and his play the last day was outstanding. He flew a bit under the radar most of the day, which was to his advantage. The story line is that Spieth lost the Masters, but Willett stepped up decisively when given the opportunity. So he earned it. Good work.